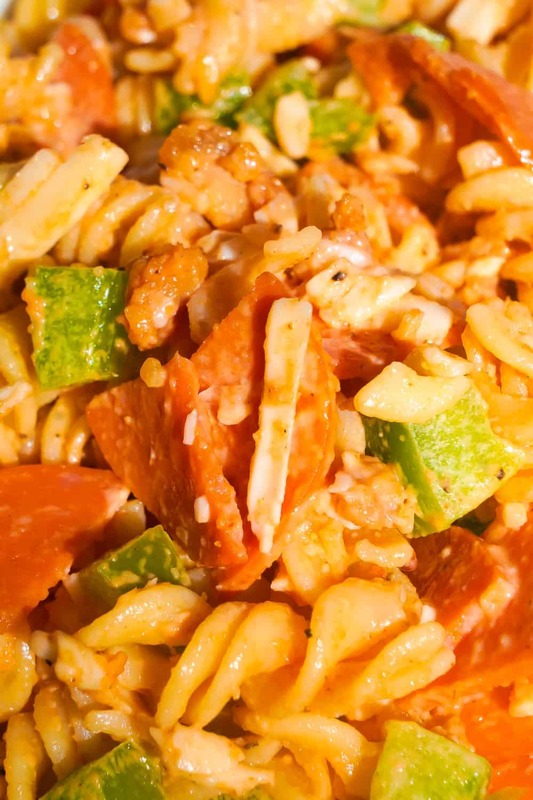 Pizza Pasta Salad is the perfect summer side dish. 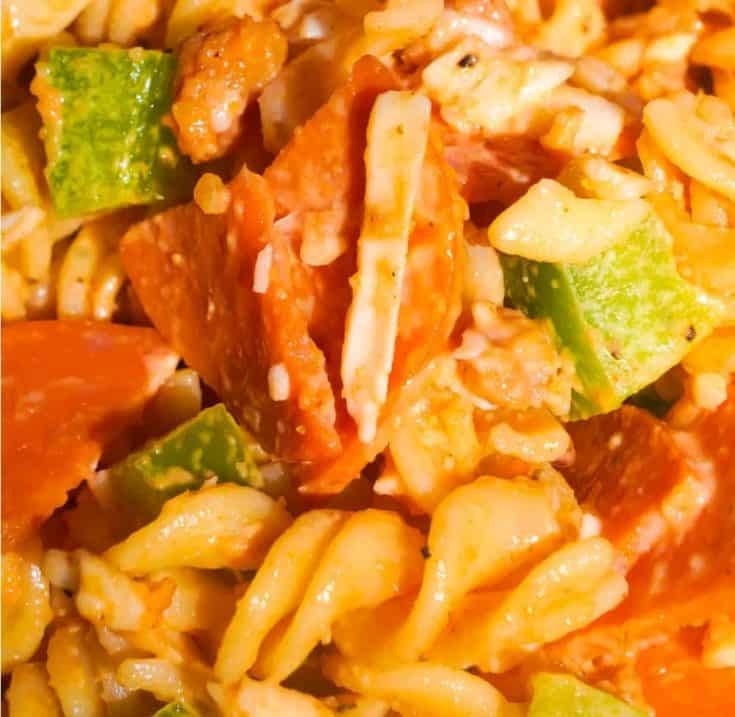 This pasta salad is loaded with pepperoni, bacon, green peppers and mozzarella cheese. 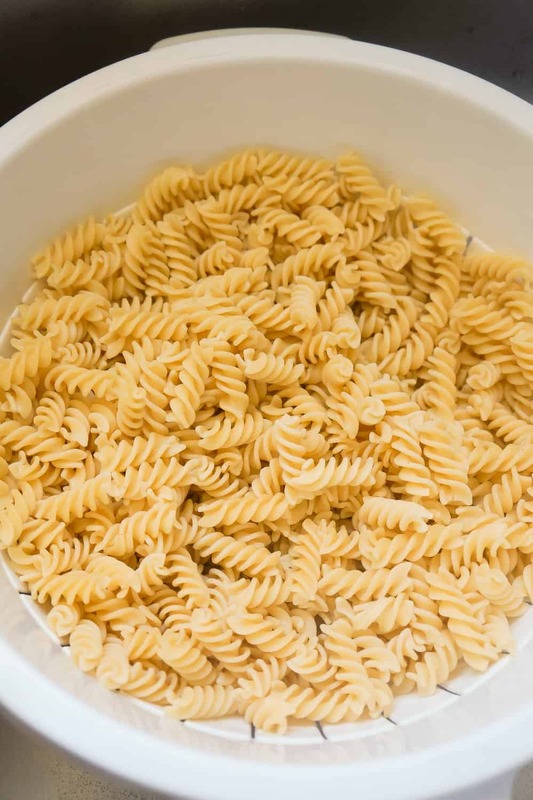 To make this dish I started by cooking some fusilli pasta. Once the fusilli was cooked I drained it and ran it under cold water in the sink to cool it down. I placed the cooked and cooled pasta into a large mixing bowl and added in some diced pepperoni, diced green peppers, real bacon bits and shredded mozzarella cheese. I stirred until all the ingredients were mixed in. Then I added some mayo, pizza sauce and seasonings. I stirred well again until all of the pasta was well coated in the mayo and pizza sauce. This pasta salad can be served immediately but I prefer to refrigerate it for a couple of hours first so that the pasta can really absorb all the flavours. 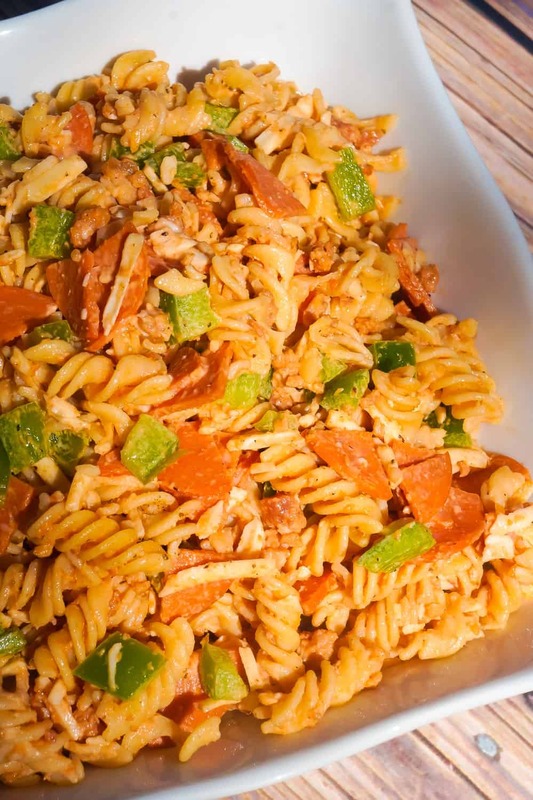 This Pizza Pasta Salad is the perfect side dish to serve at a potluck or BBQ. If you are looking for more easy side dish recipes check out Sweet Chili Bacon Pasta Salad and Bacon & Egg Pasta Salad. 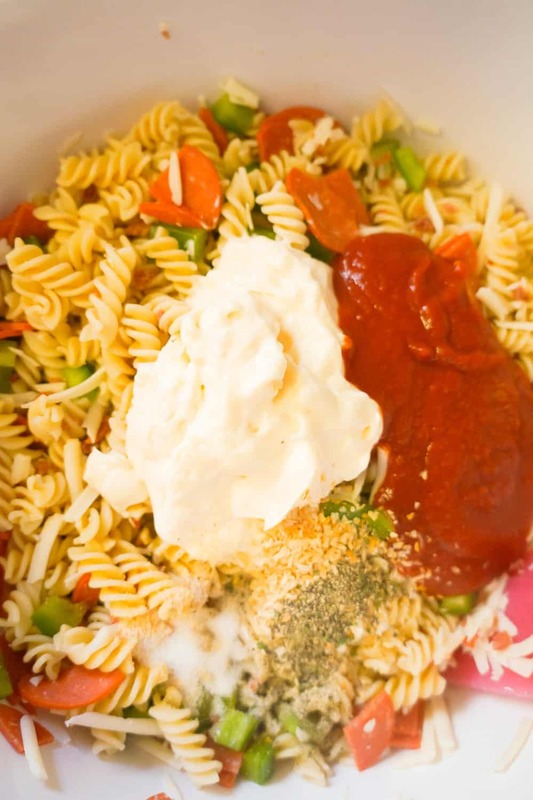 Pizza Pasta Salad is the perfect summer side dish. This pasta salad is loaded with pepperoni, bacon, green peppers and mozzarella cheese. Cook fusilli according to direction on the package. Then drain and run under cold water until cooled. 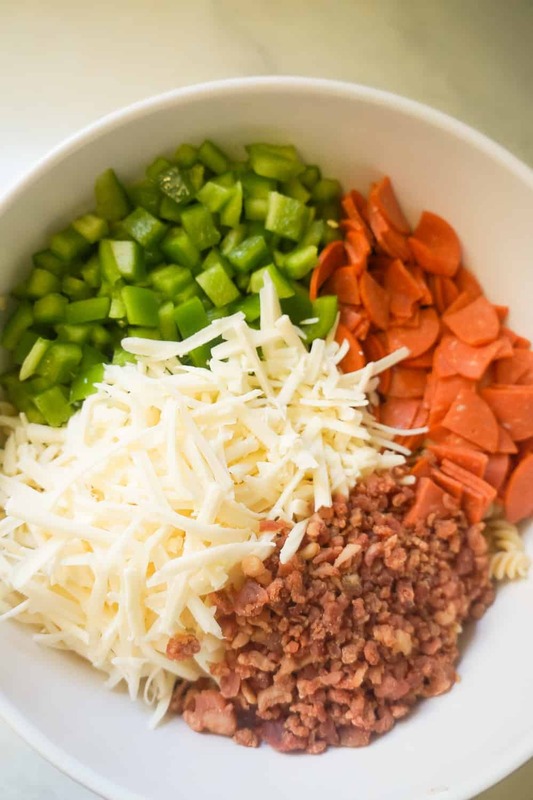 Place the cooled off pasta in a large mixing bowl and add in the diced pepperoni, diced green peppers, bacon bits and shredded cheese. Stir well. Add in the mayo, pizza sauce, dehydrated minced onion, garlic powder, salt and pepper. Stir until all of the pasta is coated in the mayo and pizza sauce mixture. Can be served immediately but it's best to refrigerate for a couple of hours to let the pasta absorb all the flavours.